Architecture has high cultural and socio-political relevance. As a visual and kinesthetic medium, it structures not only space, but also orders of knowledge and modes of perception. Yet how can this be scientifically described or investigated? This volume provides a comprehensive reflection on architecture from a transdisciplinary perspective. It brings together a number of recent approaches from philosophy, sociology, media, culture, art, film, literature, dance, and musicology, which address the cultural significance of architecture from the perspective of their own respective discipline. Susanne Hauser (Prof. Dr.) lehrt Kunst- und Kulturgeschichte im Studiengang Architektur der Universität der Künste Berlin. Julia Weber (Dr. phil.) ist Leiterin der Emmy Noether-Nachwuchsgruppe »Bauformen der Imagination. 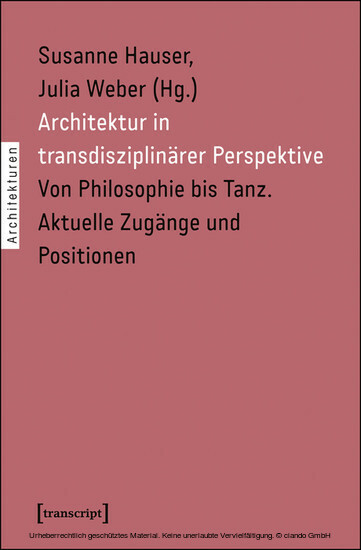 Literatur und Architektur in der Moderne« am Peter Szondi-Institut der Freien Universität Berlin.